The plan is to to add the Directional Volatility (DV) Indicator to our HA toolkit, currently offered by eSignal, in their next Release (7.9), due some time in middle of Q1 2005. If there are any delays in the roll-out of that Release, the timebomb for both TradeStation and eSignal versions will be extended accordingly. We have added CI Diff to the CI and DCI Indicators Package. Cost remains at $90 per quarter. What CI Diff does is to anticipate the topping or bottoming of CI. It achives that by plotting, in a separate subgraph and in histogram format, the difference between CI and its signal line (blue curve minus red curve, respectively). the EasyLanguage Code our DV Indicatoris refreshed to make sure we have the right colors in the right plots. Plot1(the DV indicator) should be in BLUE. Plot2(the signal line) should be in RED. Since we are approaching February 1st, it is time to extend the timebomb on Hamzei Analytics' DV Indicator. We renamed the ELD file so we can work around the current release 8.0 bug (can not write over existing ELD file). The How-to PDF for the DV Indicator will be posted in the next 72 hours. I am told by the Office of Peter Parandjuk, the TS CTO, that version 8.1 will have a bug fix for this issue. I have not run the v8.1 beta-test...We are still running v8.0 inhouse, since we need to stay compatible with our existing userbase. We understand that on Tuesday nite, 2/8/05, TS servers will commence rolling everyone to v8.1. We shall re-visit this issue this week and update you on our findings. The (first draft of the) How-to PDF for our DV Indicator is now posted. sorry for the delay.........we have been jammed with new product roll-outs and website infrastructure redundancy built-outs. The timebomb for our Directional Volatility (DV) Indicator is extended to March 31st, 2005. It will not be extended again........so use it now and share it with your buddies. We have begun using TS v8.1 (B2140) on two PCs as an operational testbed. We WILL upgrade and post new code for you here once we are done testing this latest Build. Current code here is TS v8.0 B1869. VolumeExpansion which is the threshold for trigger in percent. For example, a (10,25) input value means that, if the volume of any intraday bar expands by more than 25% of the 10-day moving average of the volume of the intraday bars with same time-of-day timestamp, then put a yellow circle on high of that bar. 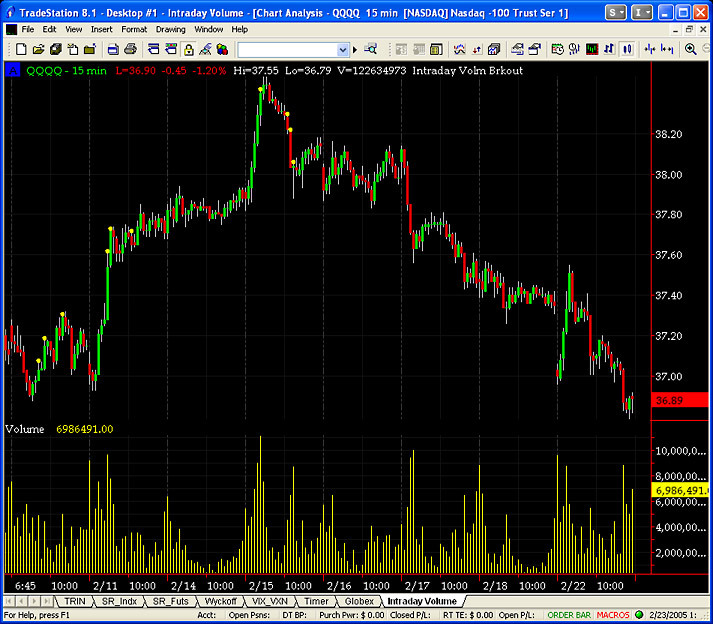 This is very useful for identifying unusaul intraday volume activity in high-beta stocks, QQQQ and stock index futures. Due to high memory usage of this indicator, the lowest intraday BarInterval allowed is the 5-min bars, and max look-back period is set to 30 days. In reality, I have found 5-day look-back with on 15-min bars as the most relevant setting. Make sure you set your requested intraday data equal to at least the look-back period plus your current window (in days, in your Format Symbol window). The timebomb for this indicator is set for expiration on April 30th, 2005. On May 1st, it will become part of our CI, CI Diff, DCI & DV Indicators package at no extra cost (http://www.HamzeiAnalytics.com/CI_DCI_Details.asp). The timebomb is still set to expire on March 31, 2005. A number of you wrote to me and asked if we ever had re-programmed the CI Indicator for the RadarScreen ? Well, we did this week and here it is.......NOW YOU CAN BUILD YOUR OWN REAL-TIME SCANNER USING THIS POWEFUL INDICATOR. my suggestion.......run them on multiple time frames: 15 min, hourly and daily intervals side-by-side. We constantly get emails from current users of TradeStation 4.0 and TradeStation 2000i asking us about the availability of our Indicators Package for their particular TradeStation version. While we tremendously appreciate the interests expressed, please allow me to address the reason why we will not support previous versions of TradeStation. As trading software developers/solution providers, we value our intellectual property (IP) and we seek secure environments to share the fruits of our hard work with legitimate, loyal and law-abiding users. Without getting into TradeStation proprietary information, it is our belief that the best protection afforded to our IP is with TradeStation v8.0 and beyond. We have reasons to believe that the previous versions' protected EL codes are no longer hard to crack/unlock and therefore it is not smart for us to ship our code in those versions. I think you will see more and more TradeStation software developers come to this realization and limit their offerings to versions that afford them the best security available. 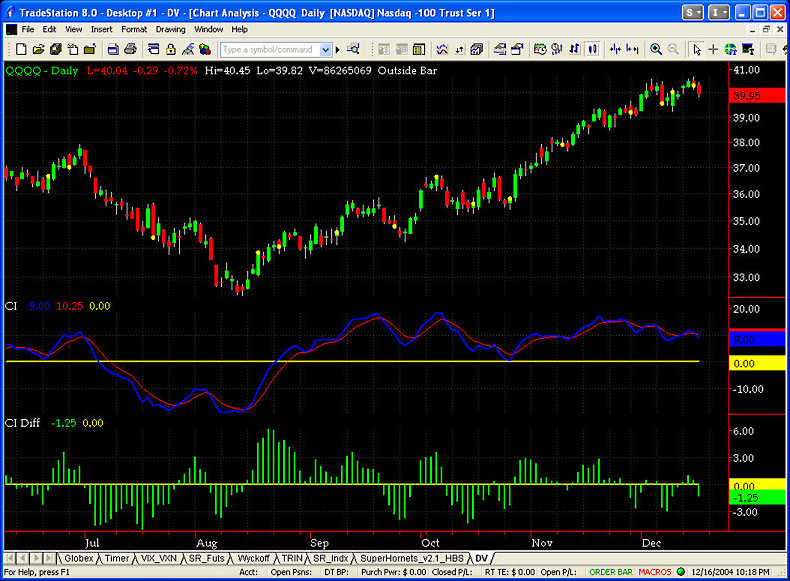 DV Indicator is now adapted for TradeStation Radar_Screen. Last week we adapted and introduced our CI Indicator for the RadarScreen. Thank you for your kind comments. This week we added DV Indicator for Radar_Screen at no additional cost. Requires TradeStation Radar_Screen v8.1 module. Our CI, CI Diff, DCI, DV and IVBO Indicators are re-compiled using TradeStation v8.1 Build 2172. We have not observed any problems with packing and unpacking ELD codes with v8.1 release. Our May 8th issue, under the direction of our new Options Strategist, Dennis Leontyev, is an OPEN ISSUE, including all its updates this week. We encourage you to forward the links to this issue to your trading buddies as well. or alternatively, you can see it on the the http://hamzeianalytics.com/HOTS_open_calendar.asp by clicking on Sunday, May 8th, 2005. We have been too busy releasing anything from our Indicators Bank....this Fall speaking schedule is filling up fast (see our NEWS page) and my book proposal to a prestigious publisher (in contract negotiations right now) has taken a lot of my personal time. The timebomb for these Indicators are set to expire on Oct 31st., 2005. Here is the transcript of the chat we had yesterday after the close featuring Greg Collins and Kevin Depew of Minyanville.com. More of these chats are planned throughout the Fall. Many thanks to Todd Harrison and Kevin Wassong of Minyanville for their generous support. The timebomb for the Indicators below is now extended to November 30th, 2005. The timebomb for the Indicators below is now extended to December 18th, 2005. Last month, the Options Institute ("OI") of the Chicago Board Options Exchange ("CBOE") graciously added me to their "Master Session" Faculty(http://www.cboe.com/LearnCenter/MasterSessions.aspx). I am honored to join Jim Bittman of the CBOE on the OI Faculty, and will be assisted in my educational endeavors in the options arena by HOTS Options Strategist & Editor Dennis Leontyev. We will conduct our first seminar on January 17th & 18th, 2006 in the Windy City at the CBOE. For further details and/or to register for this special inaugural event, please refer to the attached PDF file or the following link: http://hamzeianalytics.com/docs/cboe_master_session.pdf. On behalf of Dennis and Jim, we look forward to providing a very rewarding learning experience for all participants. The timebomb for the Indicators below is now extended to January 15th, 2006. This page was generated in 1.17 seconds. 2003-2019 TradeStation.com.